Average-speed cameras raise 800K | What Car? Average-speed cameras through a section of roadworks on the M1 motorway will have raised more than 800,000 in fines when they are taken down next month. The cameras have been in place on a 10-month stretch of the M1 in Hertfordshire since March 2006, catching an average 427 drivers per month in the 50mph section. 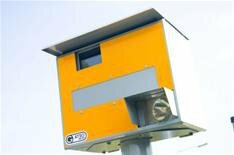 The Government claims that casualty numbers on the road have halved after the introduction of the average-speed cameras.